Skullcandy, Inc. (NASDAQ: SKUL), the original performance lifestyle audio brand, is thrilled to announce its newest addition to the family—Travis Rice, one of the most influential snowboarders of this decade. Skullcandy is partnering with Rice as part of a new athlete-owner program launching this year. Additionally, Skullcandy, Rice, and Red Bull Media House will team up this fall on the highly anticipated film, “The Fourth Phase,” the sequel to the 2011 hit “The Art of Flight,” one of the most downloaded films ever. Beyond joining forces on “The Fourth Phase” launch, Rice will be inspirational and instrumental in bringing to market Skullcandy’s most premium headphone to date, Crusher VRATM. Constructed from top-shelf materials and packed with innovative sound technology, Crusher VRA leverages proprietary Immersion35 Tech with directional bass to redefine audio experience. “The Fourth Phase” film, shot in full 4K video and new Dolby Atmos sound technology, is the perfect technological partner to showcase the unprecedented immersion of Crusher VRA and how the product can amplify multimedia experiences. Launch plans include an enhanced Crusher VRA edit of the film and Travis Rice limited edition headphones that will be available during the 2016 holidays. Rice is an enthusiastic adherent to the Skullcandy anthem to live at full volume, and is a great ambassador of the action sports heritage and future of innovation at Skullcandy. He is a one-of-a-kind talent who has set a new standard within snowboarding, earning 27 podiums along the way and a place in history as the king of big mountain freestyle snowboarding. “This is more than a partnership. I’m fully bought in as an owner so I’m committed-- in it for the long haul," said Rice. "I’m fired up about the products that we have in motion and what the future holds for innovation in the sound space." 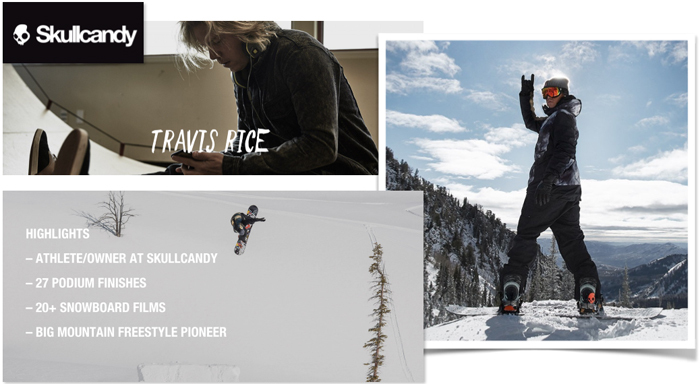 To learn more about Skullcandy, Rice and view the teaser to the anticipated film, “The Fourth Phase,” visit: http://bit.ly/Ref_TravisRice. The Crusher VRA can be previewed during the 2016 International CES at the Skullcandy booth, located at the Las Vegas Convention Center, booth: CP3&4.